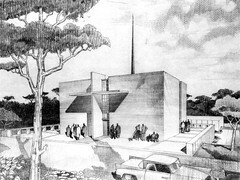 Harris Armstrong's third proposed design for the Epiphany Episcopal Church in Kirkwood, Missouri. Although this congregation had been in existence for many years, it was its first physical, architectural manifestation. Prior to the construction of this structure, the congregation operated primarily out of homes and other borrowed spaces. It was a part of the Episcopal Church, USA. This perspective drawing represents the third design proposed. The drawing was made in Armstrong's office around 1959. The built version is fairly similar to the design shown here, except for the following: the three-dimensional crucifix on the facade became separated and free-standing; the walkway around the perimeter of the main sanctuary was eliminated; and the school structure shown beyond the terrace (as well as the lower level beneath it) were eliminated from the project. These changes were all driven by a lack of adequate funding, resulting in a great deal of frustration on the part of all parties involved.